Pikachu's Winter Vacation 04: "Pichu and Pikachu's Winter Vacation 2001 [We Pichu Brothers - The Tale of the Balloon Commotion]"
Pokémon Chronicles Episode 20: "Trouble in Big Town"
The adventures in Millennium Town, the setting of the mini-movie "Pichu and Pikachu," continue! 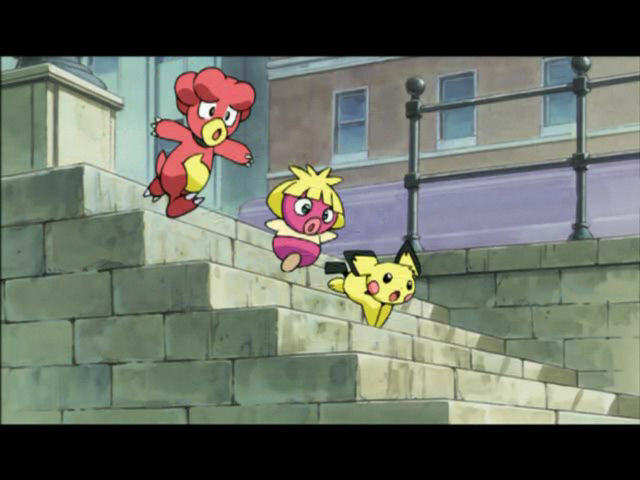 In Millennium Town, the Pichu brothers call their friends (Moochul, Buby, Upah, and Himeguma) to their hideout to spend the afternoon playing with each other. However, once everyone arrives, the two brothers get into a fight which ends up with the younger Pichu brother becoming separated from the rest of the pokemon. So, all the Pichu's friends fan out to search for him. As Moochul, Buby, and Himeguma spend their time running from an angry Delvil, Upah comes across the missing Pichu brother. On the way back to the hideout, the small mouse pokemon finds some balloons and decides to hold them. 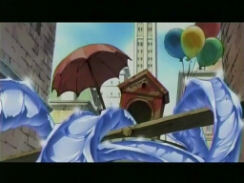 However, the balloons have enough power to lift him up, and before long he finds himself floating high above the city! A wild Yamirami uses its beak to pop the balloons, one by one, allowing the mouse pokemon to land safely. The Pichu brother eventually reunites with the other pokemon and bring him back to their hideout. There, the two Pichu brothers start to fight again, and before long the other pokemon are dragged into it as well. As various elemental attacks fly left and right, the pokemon unknowingly create a massive ice playground! 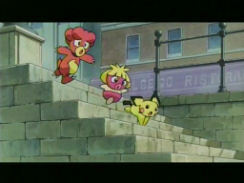 Once the pokemon notice this, they put aside their differences and play on the slide, happy to be together once again. I'm really digging these Pichu Brothers specials. I didn't think I would since I generally find the regular Pikachu shorts to be kind of annoying, but I'm really enjoying these specials for some reason. I can't put my finger on it, but there's just something about this particular gathering of pokemon that works. This special also really made me like Upah. I've never noticed how great the little guy can be. I do wonder, however, what happened to the dozens of other pokemon who hung out with the Pichu brothers in "Pichu and Pikachu." I understand that, from a production standpoint, it's much easier to deal with five pokemon instead of 50, but it's still weird to me that so many of the PIchu's friends would have just up and left like that. The dubbed version of this episode fared MUCH better than the last one. However, 4Kids really should have aired this episode before "Of Meowth and Pokémon," since this was released about three years before that episode. But hey, the short's kept in its original aspect ratio, which is a nice treat considering how rare it is to see anything dubbed by 4Kids remain in widescreen. The great jazzy soundtrack is replaced once again. The dubbed version of the third mini-movie kept the Japanese music, so if you've seen that, you know what you're missing out on in this episode. 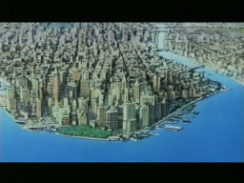 The opening shots of the city are removed. These 18 seconds are similar to the shots removed right before the title screen in the previous episode. After that, 4Kids removes the opening theme, Pichu Pika Swing. It's the same song that was used as the opening for "Pichu and Pikachu," but it's a longer version of the song and the animation's different. This opening footage lasts two minutes and 32 seconds. The narrator in the dub version is the regular TV series narrator (Mike Pollock), but the narrator in the Japanese version is Takashima Gara (and not Ueda Yuuji like in the main TV series). Aside from the difference in the gender of the narrator, a lot of the narrator's lines in this special are pretty different depending on which version you're watching. Basically, the Japanese narrator tells us about how peaceful the pokemon are and how dreadful it is when they start to argue, while the English narrator is just kind of like "oh, those Pichu brothers are at it again!" while sort of shrugging his shoulders. It's not as bad as it was in the previous episode, but it's still far from being anything close to an "accurate translation." 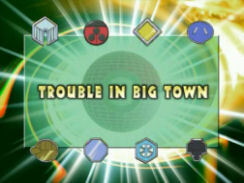 4Kids adds a Chronicles-style title screen to the very front of the episode. In contrast, the Japanese title screen doesn't occur until right before the Pichu brothers make their debut. 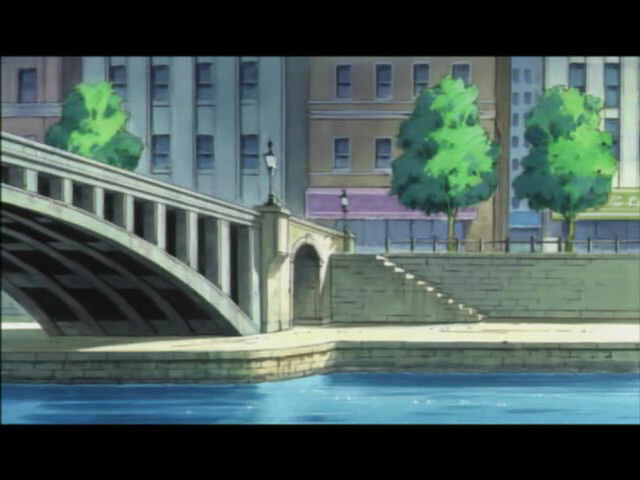 4Kids lengthens the aforementioned first shot featuring the Pichu brothers by three seconds. 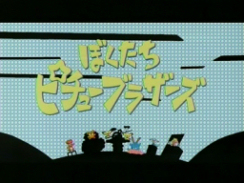 When each of Pichu's friends (Moochul, Buby, Upah, and Himeguma) make their entrance into the episode, the narrator in the Japanese version introduces each character. She tells us their name and lets us know what kind of personalities they have; for example, we're told that Buby is a fussy boy (kimuzukashii otoko no ko) pokemon and Marilli acts like the older sister type to our heroes. 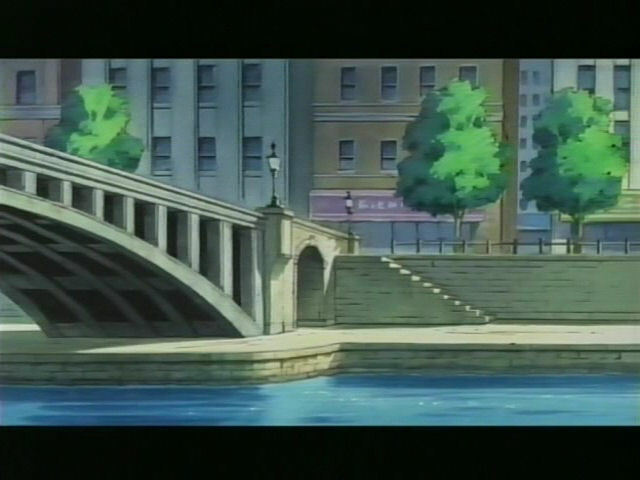 In the dub, the narrator skips the introductions and instead talks about how pokemon can't resist "the Pichu's call." While these introductions really aren't super important, since their personalities are pretty obvious, they're still nice little tidbits. 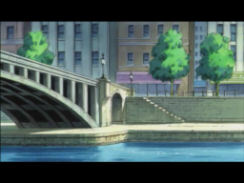 Two seconds are trimmed from the shot of the younger Pichu brother floating away on a balloon before the episode's main commercial break. Only one paint edit in this one; ALBEGO RISTURAUNT (sic) is painted away. When the Pichu hold each other in fear after Marilli flips out, one of the shots of them being frightened is extended by two seconds in the dub. 4Kids adds a Randy Newman-ish vocal song to the end of the episode, which, to my knowledge, has never been used in the dub. 4Kids didn't dub any songs for the original "Pichu and Pikachu" short, so I have no idea where this song came from...it's possible that 4Kids recorded an original song for this episode, but I find that highly doubtful. 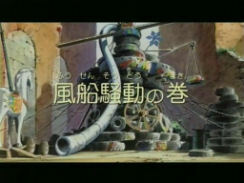 In the Japanese version, we just hear jazzy instrumental music. The last nine seconds of the episode are removed. This basically consists of a pan-up shot of the gang's tire structure thing. And hey! There's no TO BE CONTINUED text!